Christian Johann Heinrich Heine (born as Chaim Heine December 13, 1797 – February 17, 1856) was one of the most significant German poets of the nineteenth century. Heine lived during the high watermark of German Romanticism—the idyllic, idealistic days of Schiller and Goethe—but Heine was only a half-hearted Romantic. Having suffered persecution firsthand as a German Jew, Heine was far too disillusioned by the injustices of the world to fully take up the hopeful, sentimental spirit of Romanticism. Although he dabbled in utopian philosophy for a brief time, becoming a friend of Karl Marx, Heine always kept his distance from the Romantic, humanist idealism of his age. He was one of the more cynical poets of the early nineteenth century, and for this reason he is perhaps one of the wisest; his poetry avoids the high flights of fancy that so marred later Romanticism, and his opinions, though harsh and often pessimistic, come as a breath of fresh air in the poetic universe of unrealistic Romantic humanism. Heine is often labeled the first of the "post-Romantic" poets. His criticisms of Romanticism, which became more and more scathing as the poet matured, would help to precipitate the realist phase of literary history. Heine's critiques of German thought and culture made him highly controversial in his native country; his works were banned in Germany for decades, and his poems were publicly burned during the reign of the Third Reich. Ironically, one of Heine's poems includes the lines "Where they burn books / They will, in the end, burn human beings." Heine's insight into the human condition, and his constant search for real hope and change, make him one of the most moving and influential poets in the European tradition. His conversion to Christianity and attempted assimilation into German Christian culture, only to be scorned and reviled by Nazi hatred of Jews makes Heinrich a pure case and embodiment of one of the enduring horrors and tragedies in European history, namely the Christian abuse and inhuman oppression of its Jewry. Heine was born into an acculturated Jewish family in Düsseldorf, Germany. His father was a tradesman, who, during the French occupation, found new prospects opening up for Jews. When his father's business failed, Heine was sent to Hamburg, where his uncle Salomon encouraged him to undertake a career in commerce. Salomon Heine was famous in his own right as a multi-millionaire and one of the must successful businessmen in German history to that point; Salomon encouraged his young nephew to follow in his footsteps and take up a career in banking. Heine, however, failed miserably as a businessman, and, with his uncle's financial support, he turned to the study of law at the universities of Göttingen, Bonn and Berlin. Heine quickly discovered that he was more interested in literature than in the law, nonetheless earning a law degree in 1825. During his time at university he also decided to convert from Judaism to Protestantism. Heine believed that this was necessary because of the severe restrictions on Jews in almost all of Germany; in many cases, Jews were forbidden to enter certain professions or live in certain regions, and antisemitic persecution was experienced every day. Particularly problematic for Heine, Jews were forbidden to lecture at universities, so Heine, who dreamed of one day becoming a professor, saw no choice but to abandon his religion. As Heine said in self-justification, his conversion was "the ticket of admission into European culture." For much of the rest of his life Heine wrestled over the incompatible elements of his German and his Jewish identities. During his college years Heine also fell hopelessly in love with two of his uncle's daughters, Amalie and Therese, both of whom rebuffed his advances and ridiculed Heine over his financial failures. Heine was heartbroken by these incidents, but he poured his emotions into his poetry, creating what is perhaps the most memorable of his works, Die Buch der Lieder (The Book of Songs). This early volume, consisting primarily of love poems dedicated to Amalie and Therese, is most certainly written in the tormented mode of German Romanticism, similar in style to the works of Johann Wolfgang von Goethe and Friedrich Schiller. Heine, however, brings a unique element to his love poetry: his poems, far from being sentimental, are bittersweet and self-doubting. The poet frequently questions whether his feelings are, after all, as powerful as he thinks they are, or worth the effort he has invested. In so doing Heine proves himself to be a much more honest and human poet than any of his contemporaries, as well as much easier for modern audiences to digest. For these reasons Heine has often been labeled the first "post-Romantic" poet, as he was one of the first poets of the nineteenth century to openly cast doubt on the values of Romanticism. In particular, Heine's poetry would constantly question the divide between "poesy" and "reality"—that is, the divide between the flighty world of the artistic imagination, and the material world. In 1824, while still at Gottingen, Heine took a break from his law studies to travel in the Harz Mountains. While on his travels Heine wrote a short book about his experiences, freely mixing in imaginative fancy and social commentary with his loving descriptions of nature and the mountainsides; Der Harzreise (The Harz Journey) became the first in a series of travel books that would earn Heine a modicum of critical acclaim, the first stepping stones in the development of his literary celebrity. In addition to the book on the Harz, Heine would write additional travelogues for a trip to England, in 1827, and a journey to Italy undertaken in 1828. The most popular of all Heine's Reisebucher, however, would be the last volume, entitled Ideen. Das Buch Le Grand (Ideas. The Book Le Grand), in which Heine would take a whimsical "journey" into his own self. The book, a curiously lyrical melange of memoir, meditation, and journalistic commentary, would prove to be one of Heine's most popular. Following the July Revolution of 1830, Heine left Germany for Paris, France in 1831. Heine was particularly attracted to Paris because of the pseudo-religion of the socialist philosopher, Count Saint-Simon. Saint-Simon hoped to organize a utopian state, in which the State owned all property, and everyone would be rewarded based on the quality and amount of their work. Heine was attracted to this utopian vision, believing that it might at last bring an end to the long history of persecution and injustice which he saw as having tarnished all of human history. In Paris, Heine began a career as a journalist, first contributing articles written in German on the progress of the revolution, which were collected in a book entitled Französische Zustände (French Affairs) and published in 1832. Later, as it began to dawn on Heine that he would never return to Germany again, he began to write a series of works of cultural criticism, this time in French, critiquing German culture and particularly chastising what he viewed as the failed movement of Romanticism. Heine remained in Paris for the rest of his life. In 1844, he published a second volume of poems, Neue Gedichte (New Poems) that illustrated the poet's disillusionment with Romantic ideology. The volume contains a sequence entitled "Verschiedene" that is a satirical, grotesque version of his earlier love poetry; the "Verschiedene" poems describe the poet's bitter feelings and resentment towards a litany of fickle French girls of loose morals and little devotion. The "Verschiedene" poems earned Heine a significant degree of scorn, though they are now recognized as a comic masterpiece that signaled the end of German Romanticism. Neue Gedichte also contained a number of satirical poems written on political topics, meant to illustrate the need for social reform. Many of these poems had been written for Heine's close friend, Karl Marx, and published in Marx's newspaper Vorwärts (Forward). Despite his isolation in France, Heine continued to comment on the evolution of German culture. Following a visit to Germany in 1843, Heine wrote a long satirical poem Deutschland. Ein Wintermärchen (Germany. A Winter's Tale), an account of his visit and a harsh lampooning of the political culture of the German people. Disillusioned with Saint-Simonism and utopanism in general for some time, Heine also satirized utopian politics with another long satirical poem entitled Atta Troll: Ein Sommernachtstraum ("Atta Troll: A Midsummer Night's Dream"), published in 1847. Oh, once I had a lovely fatherland. Up to the sky, the gentle violets swayed. How good they rang) - the words "Ich liebe dich!" Look at one another, yawning. Emptied is the flaming cup. Darkened now are all the lanterns. 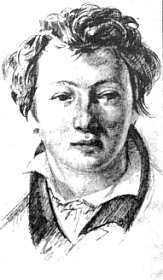 Heine finally succumbed to his long illness in 1858, and was buried in Cimeterie Montmartre. This page was last modified on 13 December 2017, at 22:11.